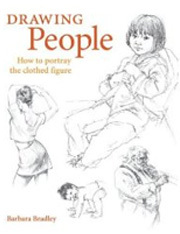 In Drawing People, award-winning illustrator and instructor Barbara Bradley provides all the information you need to render clothed human figures with energy, detail and control. Bradley begins by teaching the basics of any drawing, including proportion, perspective and value. Next, you’ll learn how to overcome the special challenges posed by clothing, including fabric folds and draping effects. Bradley illustrates how they’re constructed and how to draw them in different situations—on male and female figures that are active or at rest. These reliable, proven drawing techniques will add a natural feel to your art, resulting in figures that look as if they could walk, run or dance right off the page.